We’re the professionals in truck driver training. That’s why the Indianapolis CDL training campus offers a driving range with over 12 acres of flat asphalt pavement. The training center driving range provides ample space and safety for practicing low speed truck driving exercises. The ample size and configuration of the driving range provides trucking students plenty of space to master the driving skills necessary to operate a tractor-trailer. Some of the CDL skills that can be practiced on the driving range include turning, backing, shifting and parking. The Indianapolis CDL training center driving range has a perimeter lighting system to allow for training in nearly any weather condition or any time of day. C1 is located in a modern, state of the art facility. 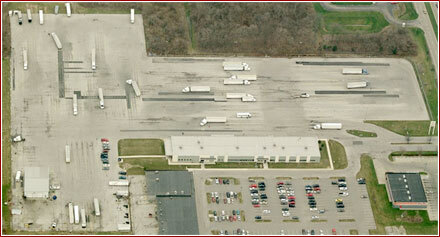 Our Indianapolis CDL training center was designed from the ground up with only one purpose: training truck drivers. The Indianapolis campus has the extra features that many truck driving schools ignore - check out the C1 Indianapolis virtual tour. In 2006, C1 moved into a brand new, custom-designed classroom and administration building. Our Indianapolis CDL training center features classrooms with multi-media technology, a truck components lab, and a comfortable student lounge. Our CDL training curriculum uses leading technologies to help prepare new drivers. C1 uses a custom-programmed multimedia classroom lecture program. To supplement classroom lectures, the CDL training staff has developed a comprehensive student training manual. The C1 Indianapolis training department combines years of professional truck driving experience and an expert knowledge of the trucking industry to create an unparalleled CDL training program. A big factor in successfully learning to drive a tractor-trailer safely is training on properly maintained equipment. That’s why C1 Truck Driver Training Indianapolis campus' entire 25 truck fleet is late-model Freightliner conventional tractors. A combination of both 48’ and 53’ van trailers are also used. The trailers have simulated loads of freight which help a student learn to control loaded vehicle in various driving situations. Need to verify past enrollment of a Driver Solutions' student? Need to schedule a Class A or B CDL skills test?